Have you heard of Cubees? I hadn't until I came across a way awesome website that has tons and tons of these printable Cubee characters. All their characters are free. Basically, you pick your favorites, download and print, then follow the super easy instructions to put them together. They have Teenage Mutant Ninja Turtles, and Star Wars, and Princess Bride, and the Tardis, and more and more and more characters. And you don't even need glue or tape to keep them together - it's purely a notch and flap system (so you will need to be accurate while cutting). 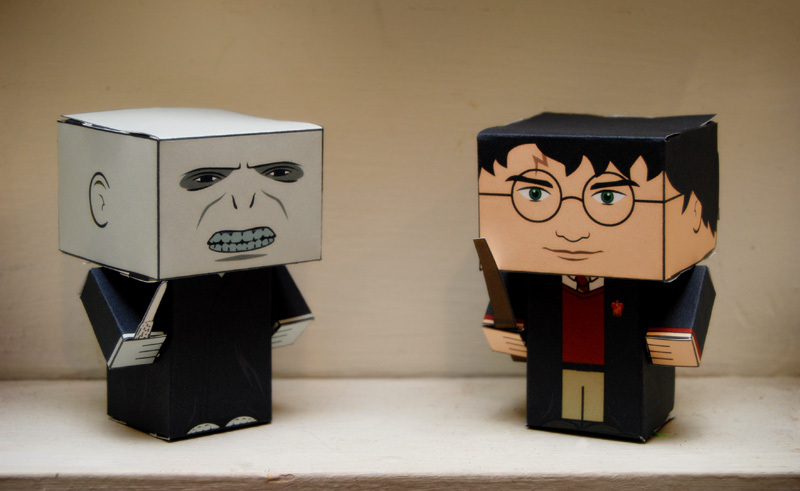 I decided to make Harry Potter and Voldemort. But only because they had the Tardis, but no Dr. Who. I'm thinking about making my own Matt Smith and David Tennant Dr's just because I WANT TO (and because I'm a humongous geek). Would you guys want some original Peonies and Poppyseeds Cubees? And, if so, what kind of characters would you be interested in? Please do tell!